Last year, WildAid reported that an estimated 150,000 manta and mobula rays were killed in 2013 so their gill rakers could be sold as part of a growing trade, mostly at the markets of Guangzhou, China. Known as peng yu sai, the gill rakers — cartilage filaments used to filter food from the water column — are not part of Traditional Chinese Medicine, but they are used in the preparation of a soup-like "health tonic." Merchants advertise a wide range of unproven health benefits and claim that peng yu sai can treat everything from skin rashes to cancer. 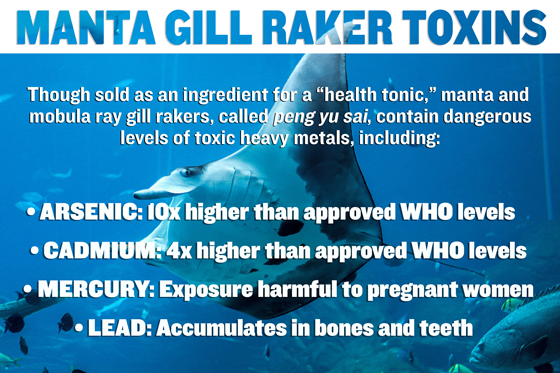 What these sellers aren’t telling their customers is that the gill rakers contain dangerous toxic pollutants and carcinogens, including arsenic, cadmium, mercury and lead. Testing shows that gill rakers can contain as much as 10 times the permissible level of arsenic approved by the World Health Organization (WHO) and 20 times the concentration of arsenic permissible by the Pharmacopoeia of China. Arsenic has been linked to several types of cancer and targets a wide range of enzyme reactions affecting nearly all organ systems. The WHO states that long-term arsenic exposure can cause cancer and skin lesions, and has been associated with developmental defects, cardiovascular disease, neurotoxicity and diabetes. Arsenic is especially harmful to expecting mothers: Studies have shown a correlation between arsenic consumption by pregnant women and low birth rates, preterm deliveries and even stillbirths. Cadmium, another extremely toxic metal, was found in gill rakers at four times the WHO's maximum permissible level and three times that recommended by the Pharmacopoeia of China. Cadmium is an industrial byproduct that can accumulate in dangerous levels in the soil, air and groundwater near industrial areas. Ingested in even miniscule amounts, it can cause kidney damage, and studies have linked cadmium exposure in pregnant mothers with fetal heart defects. The highest mercury levels found in the samples from Guangzhou were just below the Pharmacopoeia of China's permissible limits. However, mercury exposure, even in small amounts, is particularly dangerous for pregnant women because it can adversely affect fetal brain and nervous system development. The WHO considers mercury to be one of the top 10 chemicals of major public health concern. Lead was also present in the samples, though not in excess of published permissible levels. However, once lead is ingested, it accumulates in the teeth and bones and can be “remobilized” during pregnancy, attacking the fetal nervous system. Young children also are particularly susceptible to lead poisoning. The presence of these toxic heavy metals in peng yu sai directly contradicts the beneficial health claims made by Guangzhou merchants. The product is heavily marketed to breastfeeding mothers and children, even though infants and children are more likely to be harmed by exposure to these toxins. In order to raise awareness about both the health risks and the impact of this trade on manta and mobula ray populations, WildAid is conducting a demand reduction campaign encouraging the Chinese public not to consume peng yu sai. There are currently 100 billboards on the dangers of peng yu sai placed throughout the Guangzhou subway system, and in January, we released a new PSA (shown below) starring Wu Xiubo, one of China’s most popular actors. To complement our demand-side awareness campaign, WildAid continues to pursue protection campaigns in Peru, Sri Lanka and other countries where manta and mobula rays are targeted by fisheries. We will conduct education and outreach activities to build local support for manta and mobula ray protection and to strengthen existing laws and conservation measures globally. Learn more about WildAid’s manta program and how we’re working to save the planet’s manta and mobula rays from overfishing. Read about our marine protection program, which helps establish better monitoring and enforcement models for Marine Protected Areas where mantas and other species can thrive. Read about WildAid and our unique approach to demand reduction through high-impact public awareness campaigns.